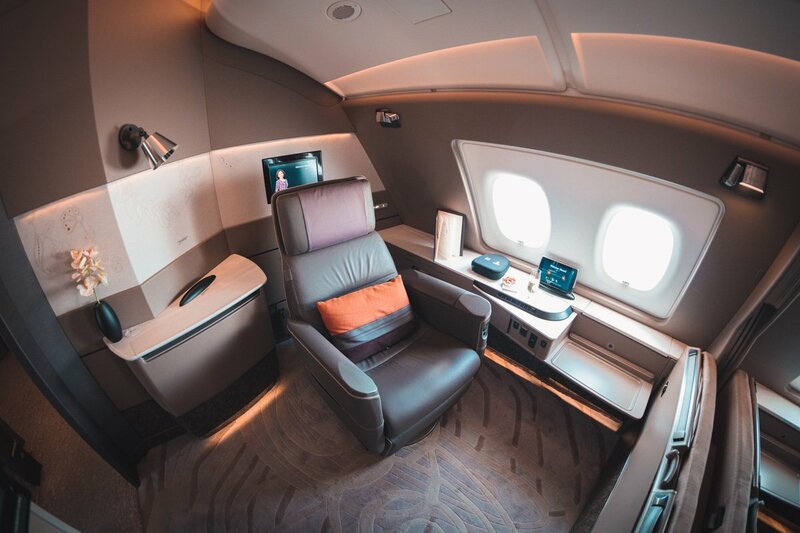 When I started in the points game, I learned very quickly that if you want to find premium cabin award seats, you need to book either as the schedule unlocks (approximately 1 year in advance), or just before departure. So when my partner and I made a relatively last-minute decision in January to attend a September wedding in Crete, I knew it was going to be tough finding award seats. 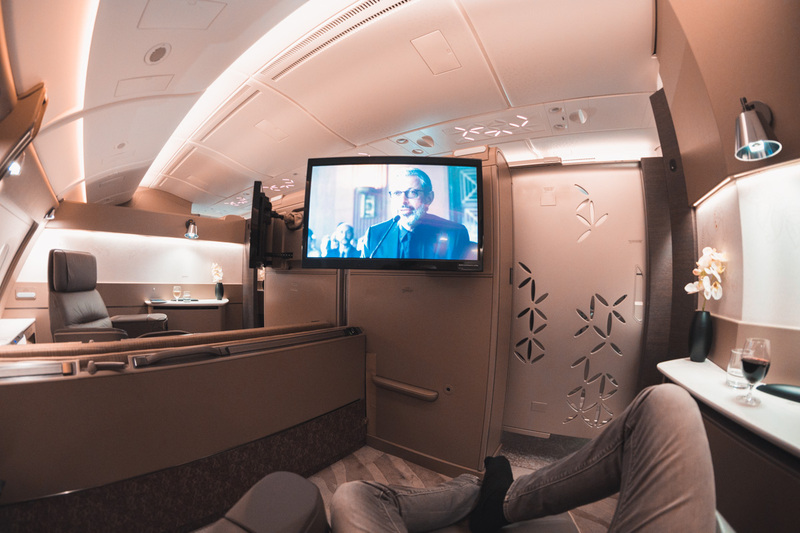 Fortunately I had no problem finding outbound business class Saver flights for 105,000 miles per person on Singapore Airlines — but I couldn’t find anything for our return journey. Thankfully Singapore Airlines allows you to waitlist for certain flights that have no more award seats, so I waitlisted for as many European city departures as I could find…some of which were only available at the higher Advantage fares of 150,000 miles per person. Eek! I realized that the first class Saver fares were actually 2,000 miles cheaper at 148,000 per person, so I also waitlisted for a number of first class flights too — and was surprised to learn that it was possible to waitlist on the A380 service out of Zurich, which had just been announced as the next new SQ A380 destination. It took until July to find flights home to Sydney. 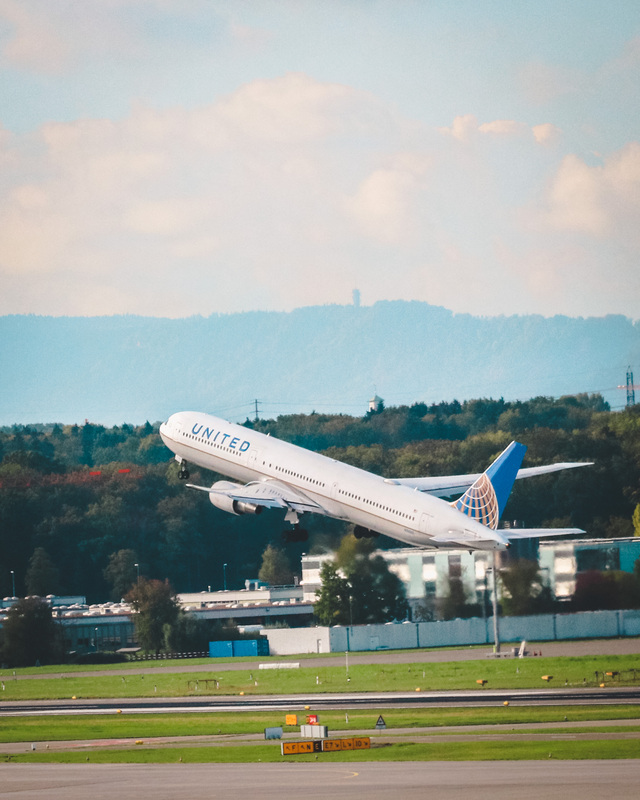 Even then, it was at the higher Advantage fare out of Frankfurt — but by this stage in our planning, I was just thankful we had confirmed seats to come home. 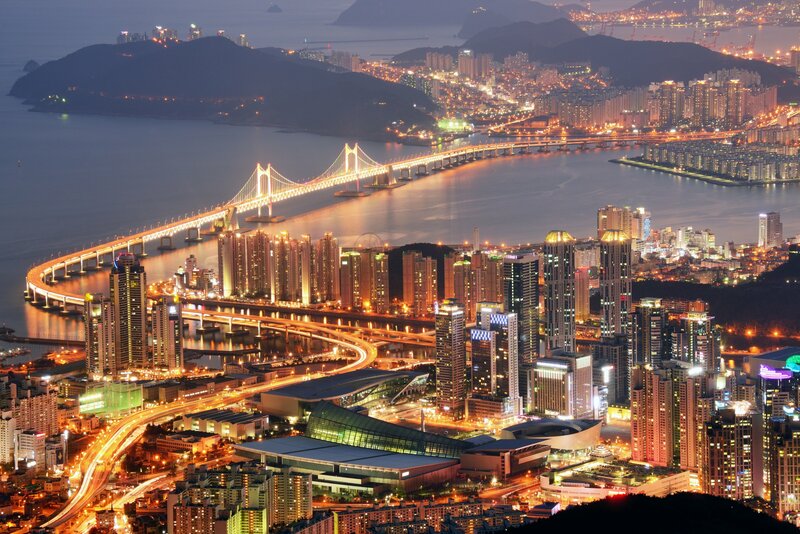 earning the points: There are many ways to earn Singapore miles for a trip just like this. 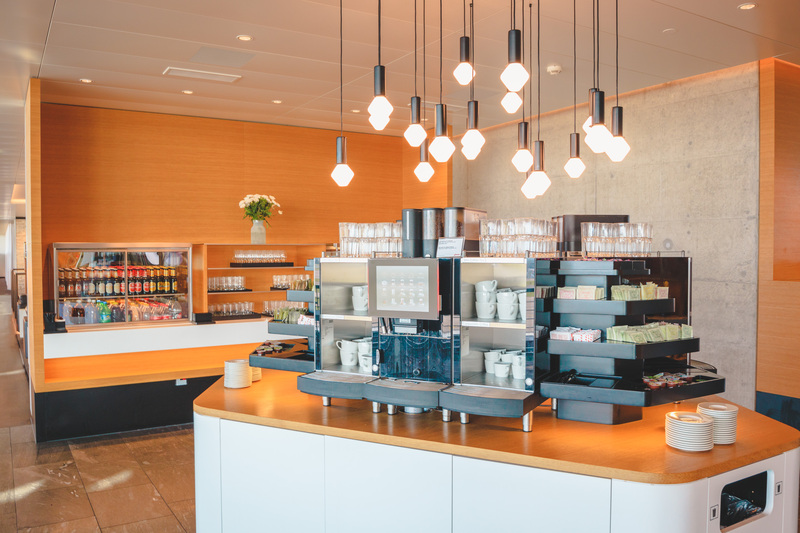 At Upgraded Points, our preferred method is to earn Chase Ultimate Rewards points with cards such as the Chase Sapphire Preferred® Card or if you’re a business owner, the Chase Ink Business Preferred. You can then transfer those Chase points directly to your Singapore Airlines KrisFlyer account, and make the booking(s)! On the week leading up to our departure from Europe, I was frequently checking the loads and seat maps on ExpertFlyer for all the flights I had waitlisted…and it wasn’t looking good. 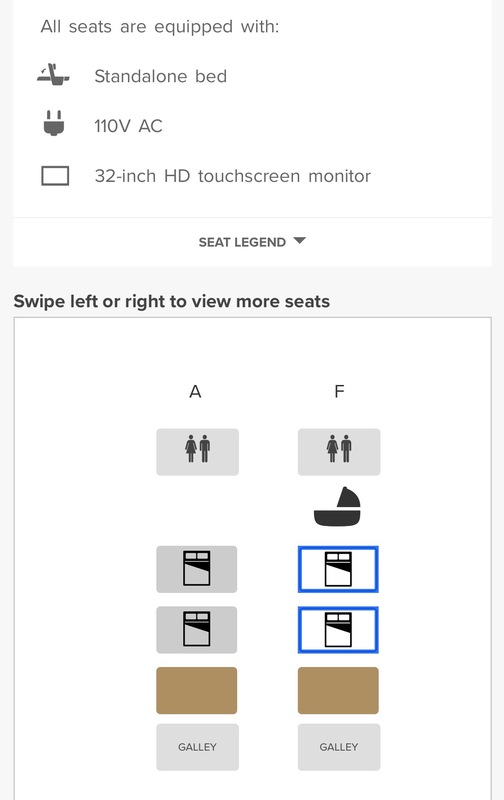 I also had alerts set up for Lufthansa first class again, as I wanted to share that experience with my partner as well. 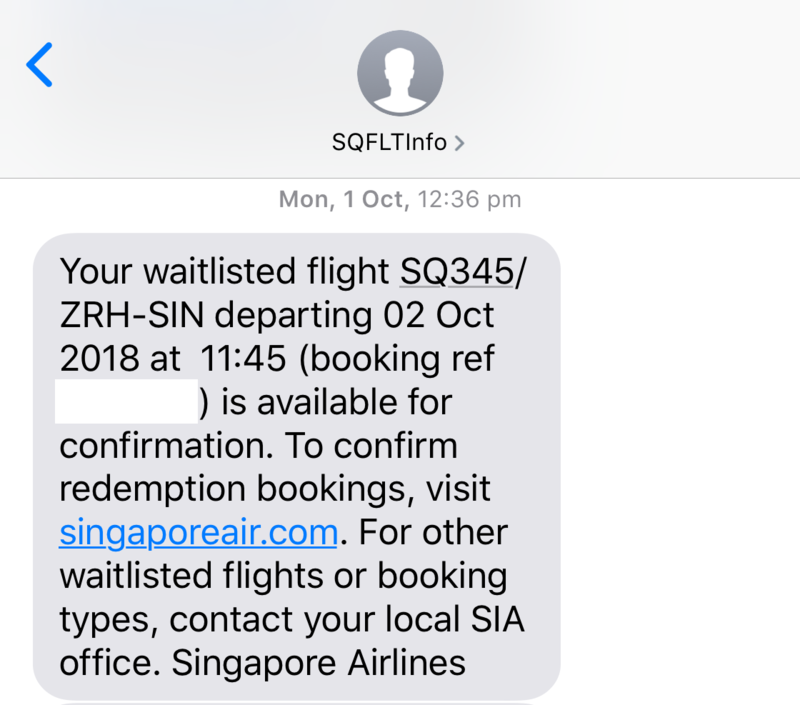 The day before our scheduled 10pm flight out from Frankfurt (still with no confirmation), I decided to call Singapore Airlines to see if there was any chance seats would unlock. The call center operator went through all my waitlists and said there was nothing she could do. I had finally given up on the better value redemption, so I booked our train tickets from Cologne to Frankfurt for the next day. The flight I thought we had the least chance of getting was actually confirmed! “We’re flying home in first class!” I shouted to an equally excited Lukas. 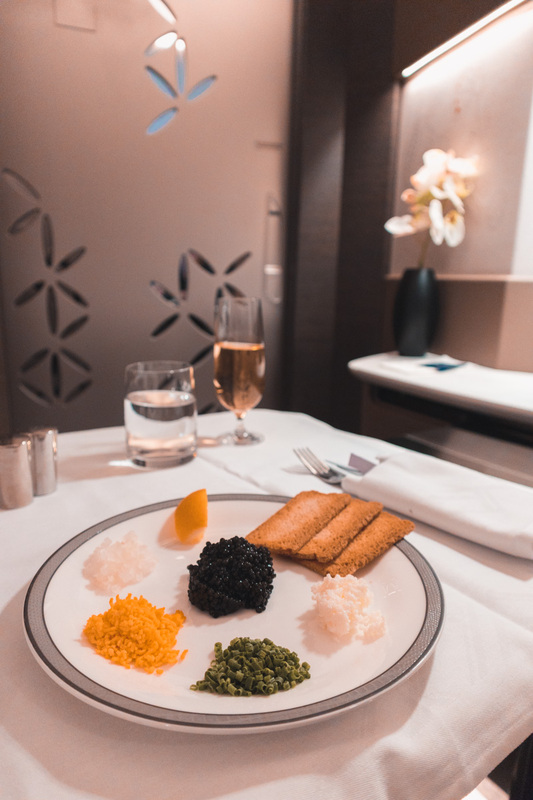 I was fortunate to try 1A in the new Suites earlier this year between Singapore and Sydney, but I was more excited to try it with Lukas this time. Thankfully, a combined suite on the F-side of the cabin was still available! Winning! 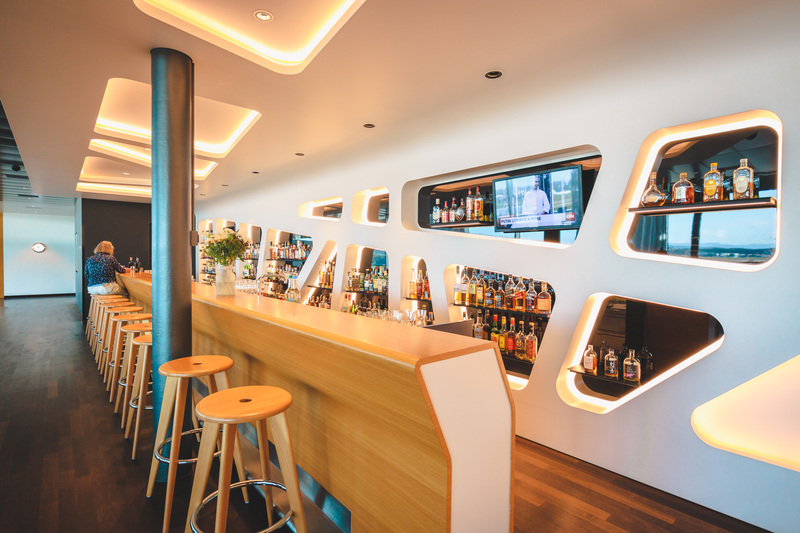 I then had to scramble to book us a cheap Eurowings flight to Zurich and a not-so-cheap last-minute accommodation in notoriously expensive Zurich. But considering this flight was worth over CHF 15,000 each, it was a small price to pay! 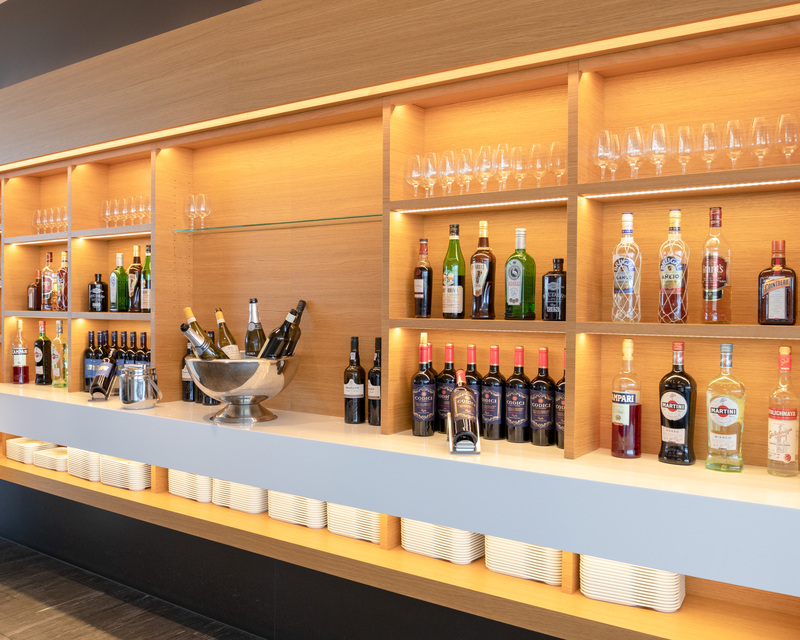 Prior to departure from Zurich, passengers traveling in Suites can access the Swiss Senator Lounge located at the E Gates. 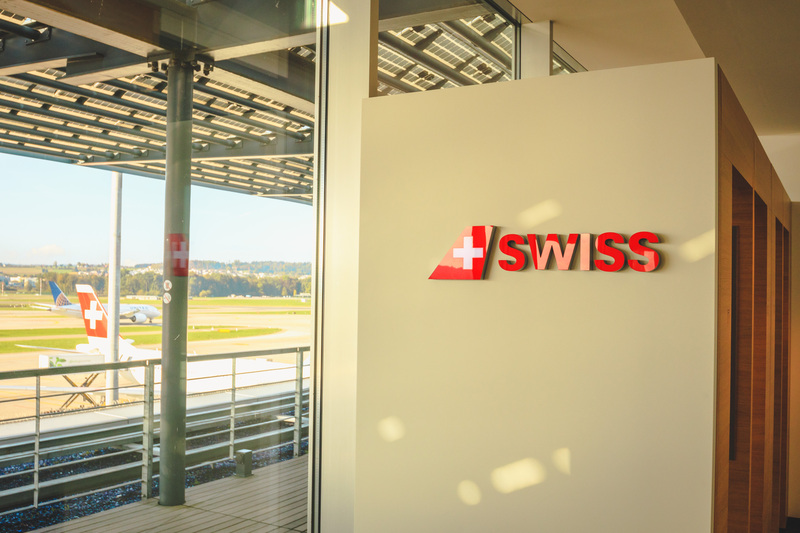 At first I was disappointed we couldn’t access the Swiss first class lounge, but that was soon forgotten when I stepped inside. 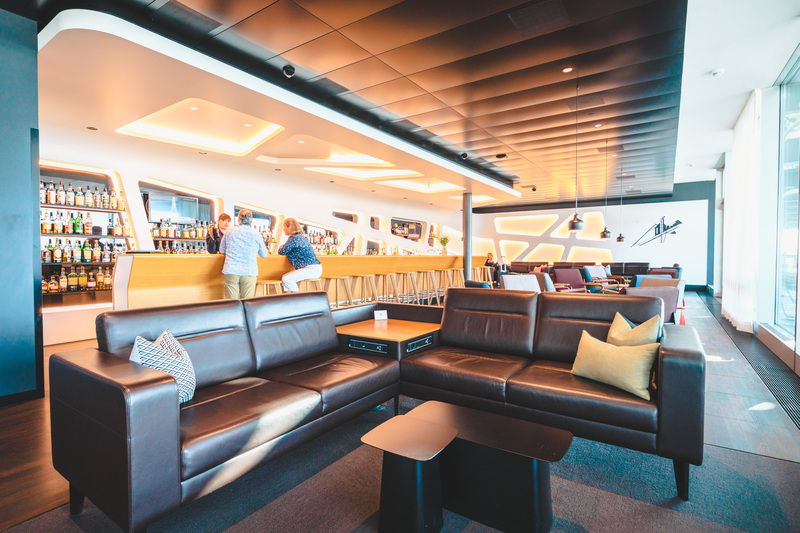 Spread out over 1,100m2, the Senator Lounge can seat over 170 passengers who are flying Swiss, Lufthansa, or Star Alliance first class (or are HON Circle, Miles and More Senator, or Star Alliance Gold members). 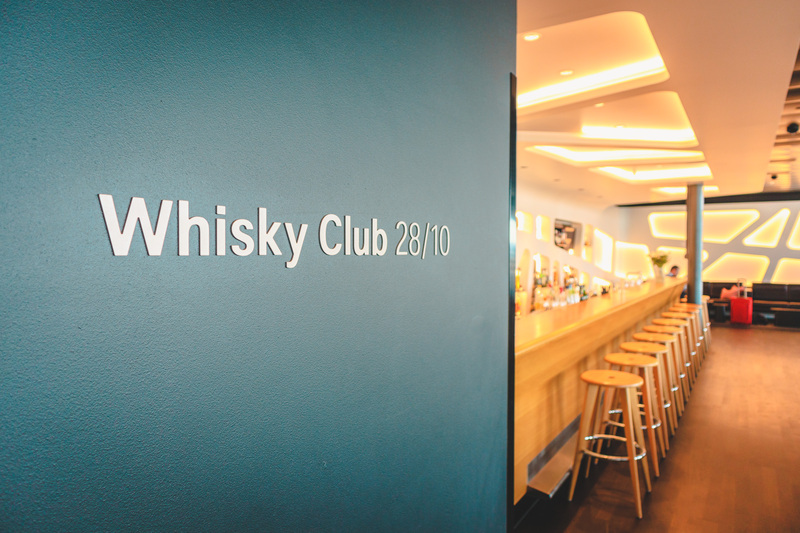 As you walk in, turn left to enter the Whisky Club 28/10, which stocks over 220 different whisky varieties from around the world. 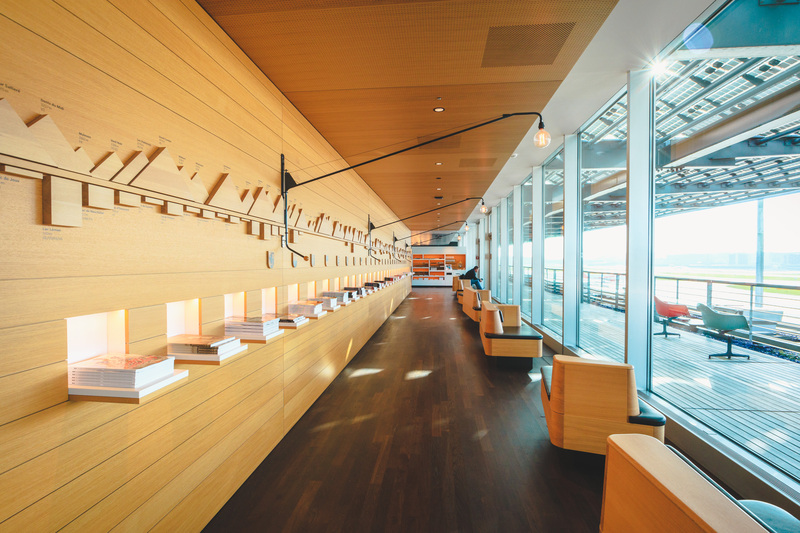 Back in the other direction, you’ll walk past the stunning display of magazine titles in the Swiss-designed wall feature. The lounge then opens into the buffet and coffee station area. Although there is no barista station, this automatic coffee machine made the most extensive list of beverages I have seen a machine create. A chef is available to cook eggs however you please. And there’s plenty of café-style seating available. 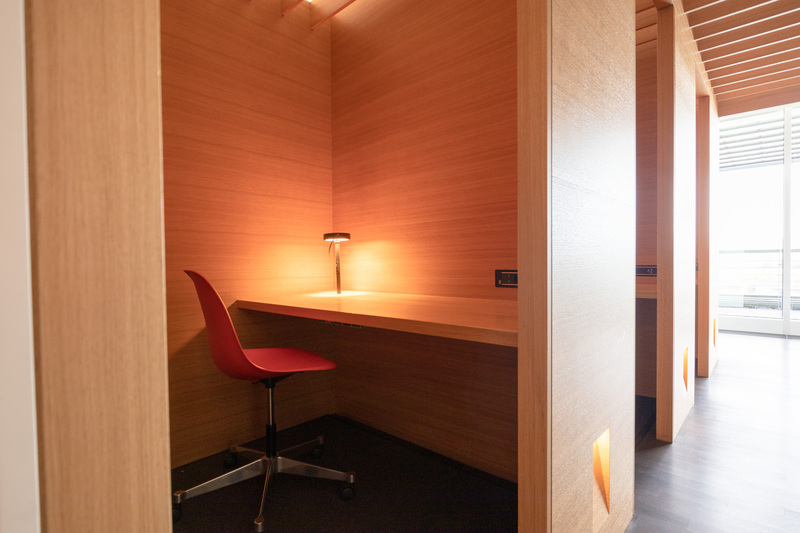 There are 6 private working pods available if you need a quiet space. 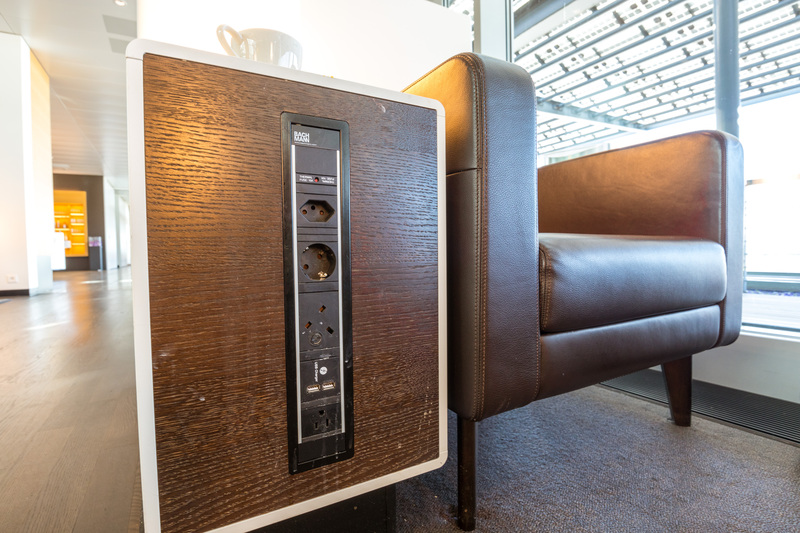 Alongside each armchair are coffee tables with 4 power sockets and 2 USB charging points. However, the highlight for this avgeek was the 325m2 terrace that faces south with a view of the 2 intersecting runways. 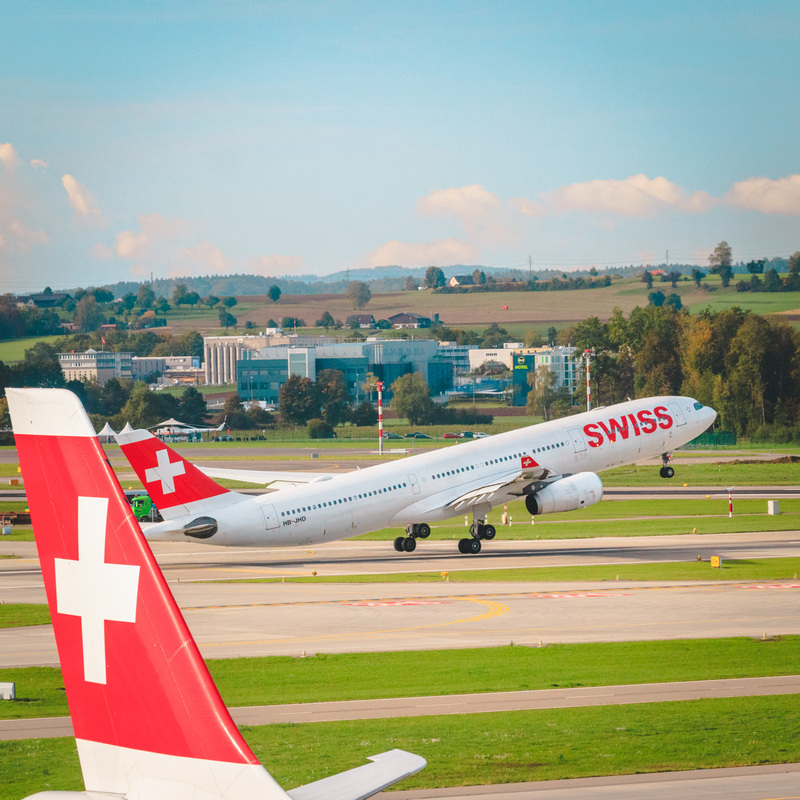 I could have spent all day just watching planes take off and land…if it weren’t for the first class flight ahead of us! Singapore Airlines currently has 19 Airbus A380s in its fleet. 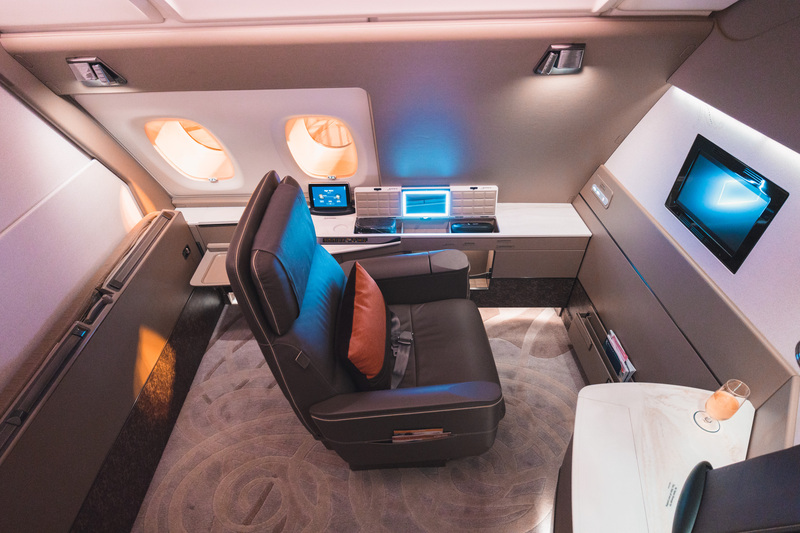 The newest aircraft features 6 first class suites and 78 flatbed business class seats occupying the entire upper deck, with 44 premium economy and 343 economy seats on the lower deck. 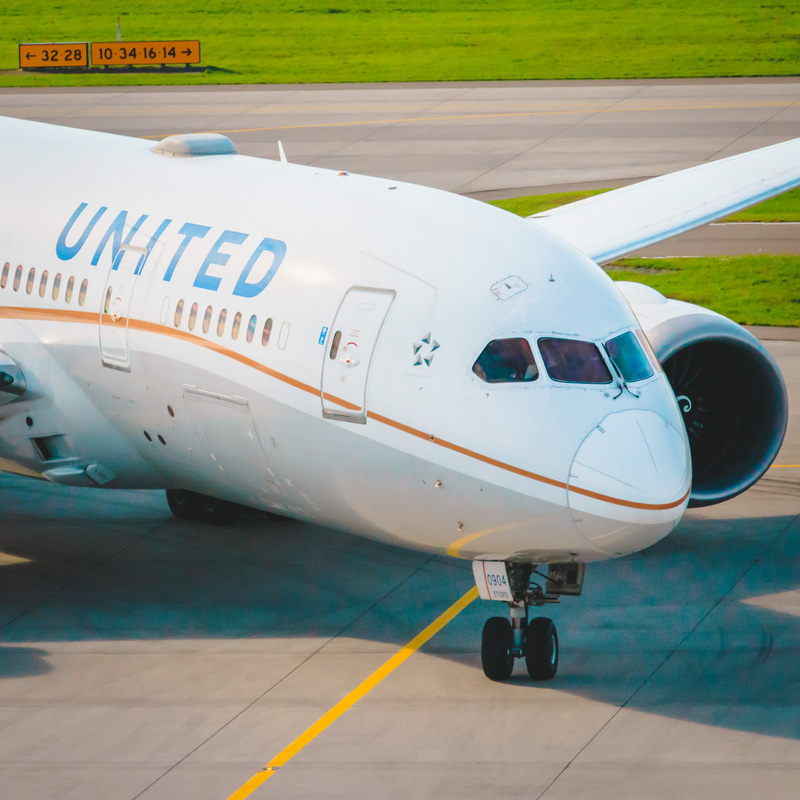 Older aircraft will be progressively refitted with the newest product by 2020, but there has been no announcement of when this kicks off. 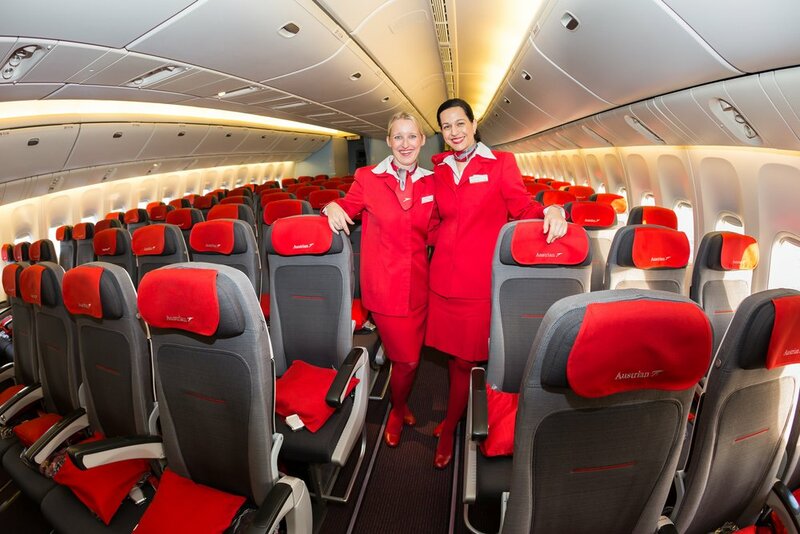 The newest aircraft are currently flying between Singapore and Zurich, Hong Kong, Shanghai, Sydney, and London. Our aircraft, 9V-SKV, was only delivered in February — it still had that new aircraft smell when we stepped aboard. The crew knew we were flying together, so the privacy divider was already down. I thought my 1A suite last time was huge, but seeing the combined space of 1F and 2F I was speechless. The space is enormous! The cabin looked spectacular with the morning Zurich sun shining through the windows. 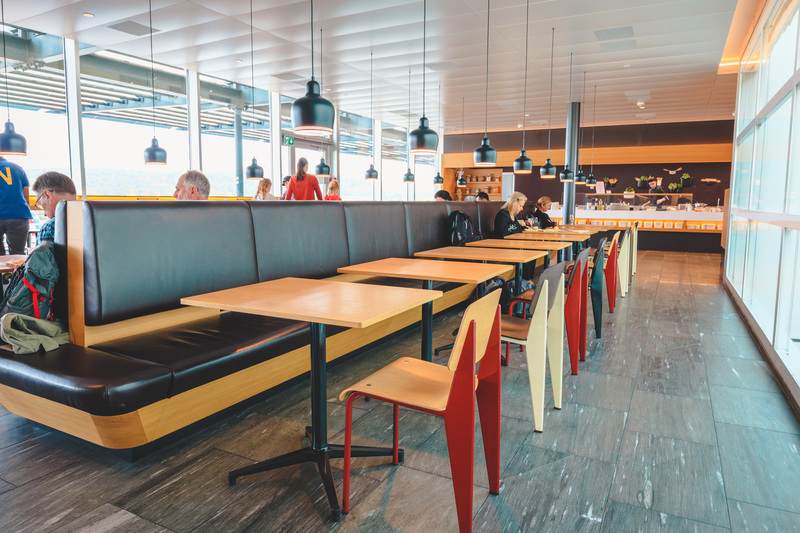 The motorized swivel chairs face forward at boarding, but you’re free to adjust them up until takeoff (when they need to face forward again). On my last flight I noticed the chair surprisingly rocked left to right about 2 centimeters, and my seat on this aircraft was no different. Housed under a cover in the left armrest are the controls for the seat, TV position, and a small remote for the IFE. 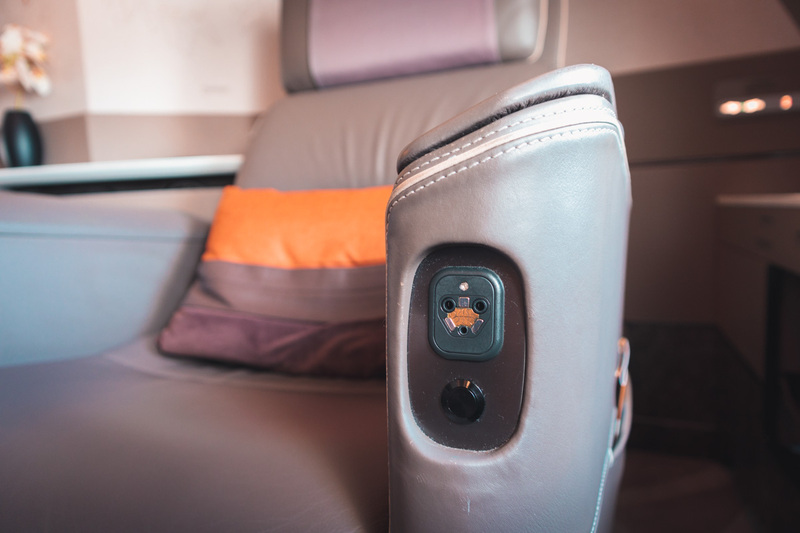 On the front edge of the armrest is a headphone socket. 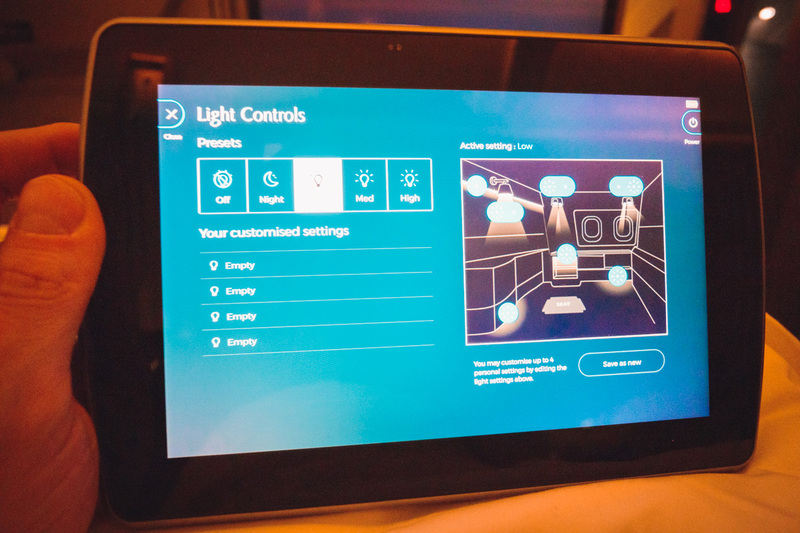 Alongside the window is a detachable tablet that can control all features of the suite, including the IFE and lighting. 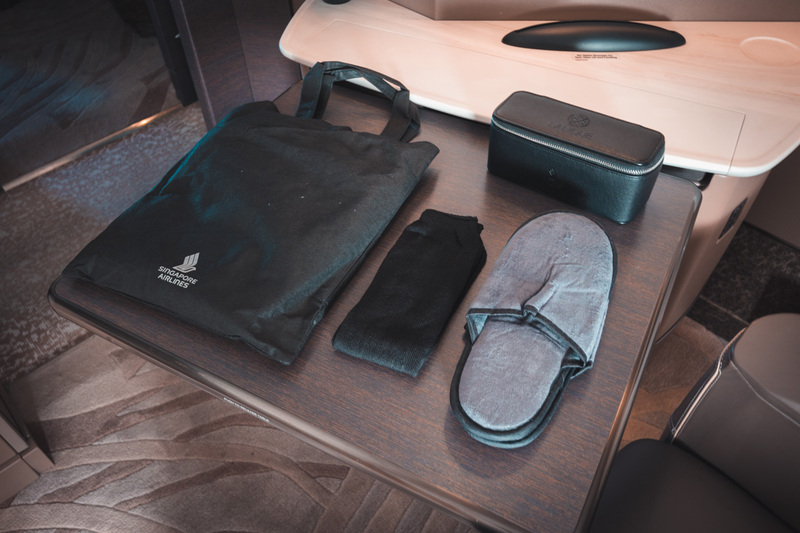 Next to this are 3 small storage spaces, which house the amenity kit, newly introduced B&O headphones (mine still had protective plastic on them! 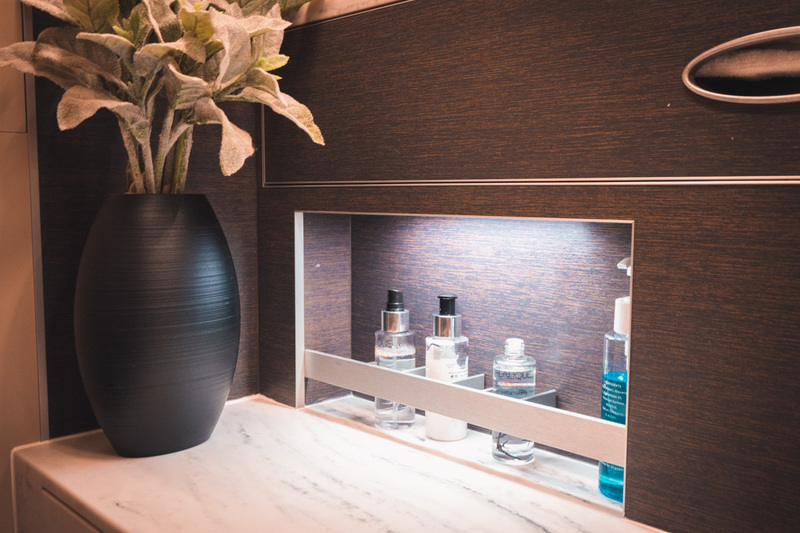 ), and a vanity mirror in one of the lids. Beneath this is further storage for a small bag. 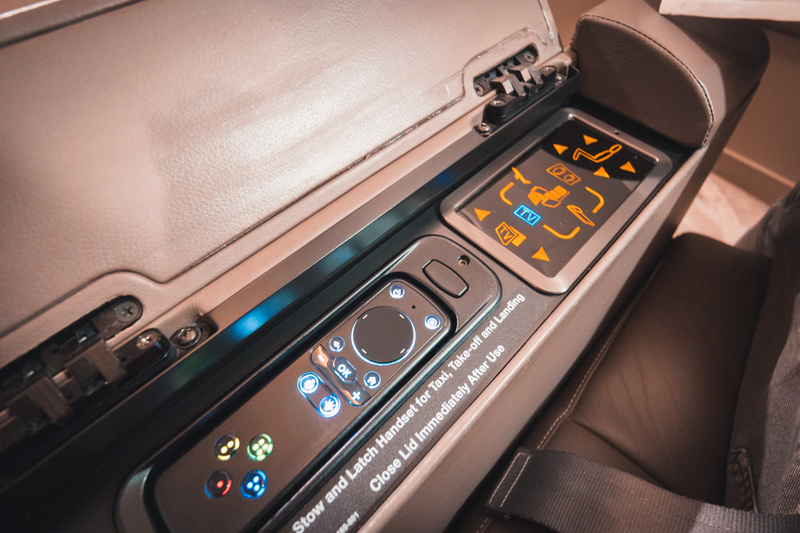 Adjacent to the tablet holder is a row of buttons for shortcut lighting themes, crew member calling, TV screen angle adjustment, and controls for the window shades. 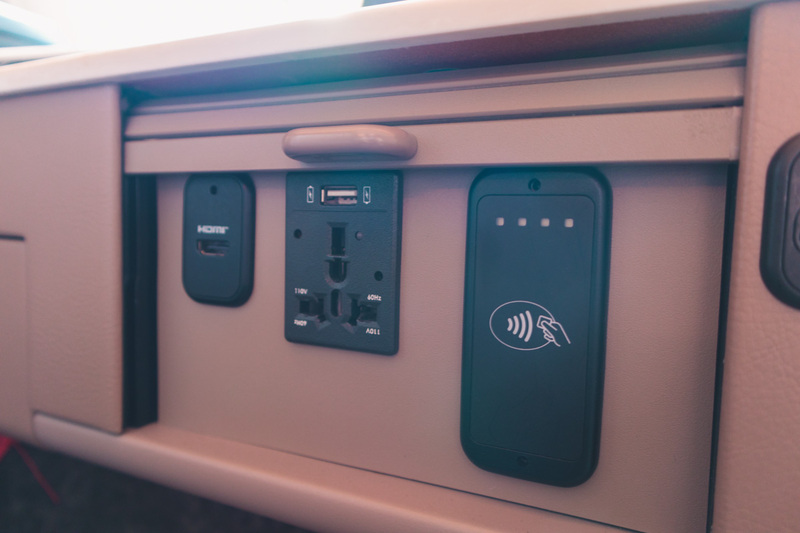 Under these buttons are a power outlet, headphone socket, RFID card scanner, and USB sockets. 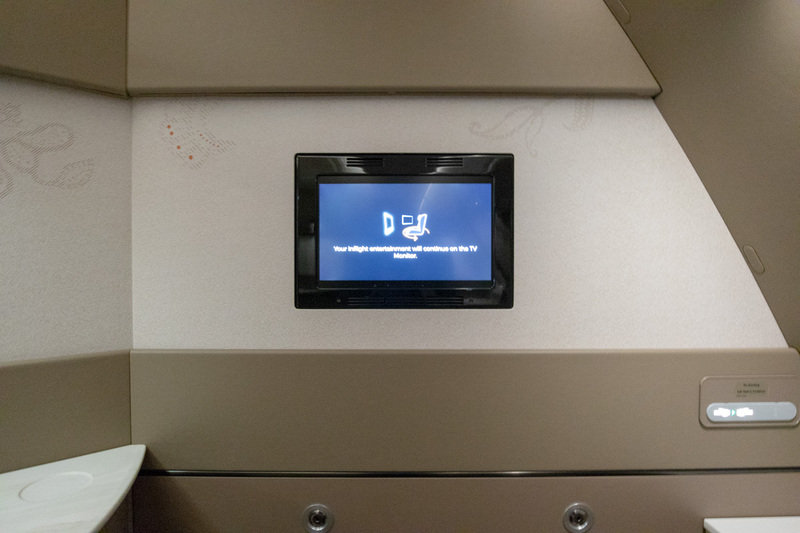 On the forward bulkhead of 1A and 1F there is a literature pocket and a small TV, which displays instructions and important information on how to use the suite before takeoff. 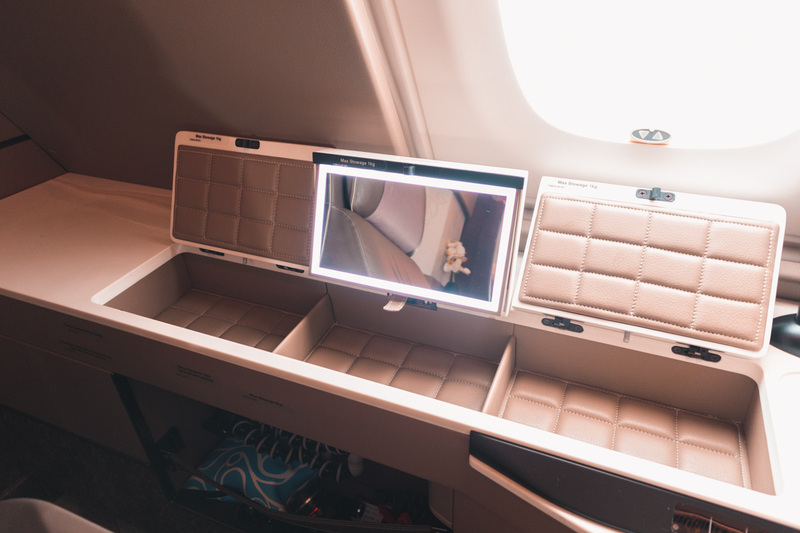 The tray table lifts up and out from the forward bulkhead, which also has an additional power and USB socket facing the seat. 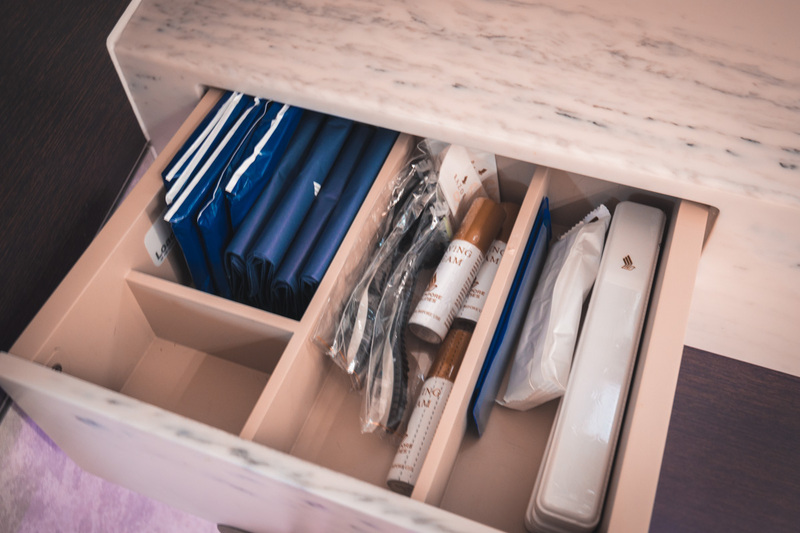 A wardrobe is located just inside the suite door with enough width to store a large cabin bag on the floor, and hang a jacket and a shirt once you change into your PJs. 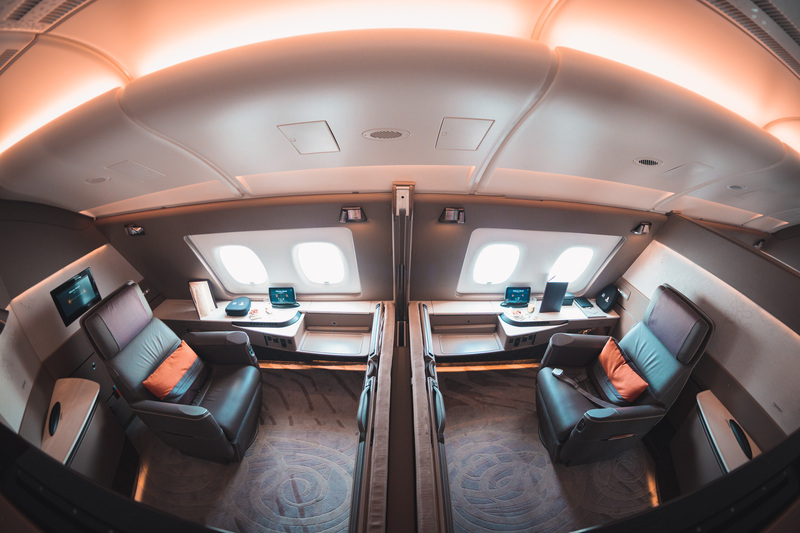 Suites 1A and 1F are the largest of the 6 and can also connect with the neighboring suites in row 2, which make them ideal if you were traveling with someone. 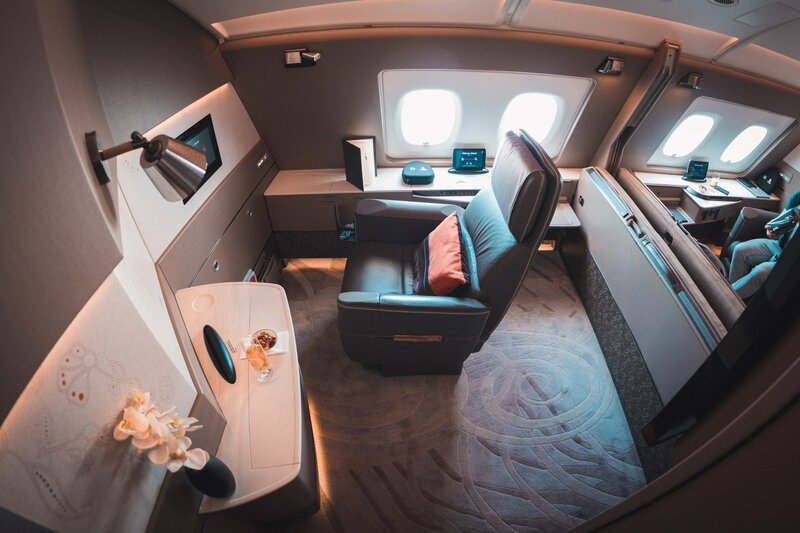 The suites in row 3 are marginally smaller than the other rows, but you definitely wouldn’t complain if you ended up in any seat in this cabin! On this flight, only 1A and 2A were occupied by another couple. 1A isn’t ideal for window lovers like me, as the swivel chair must be locked in the forward position for takeoff and landing, and it’s positioned ahead of the first window. 1F’s seat is positioned further back, so your head is in line with the window. Strangely, during takeoff, the partition between our suites unlatched and ejected upward. 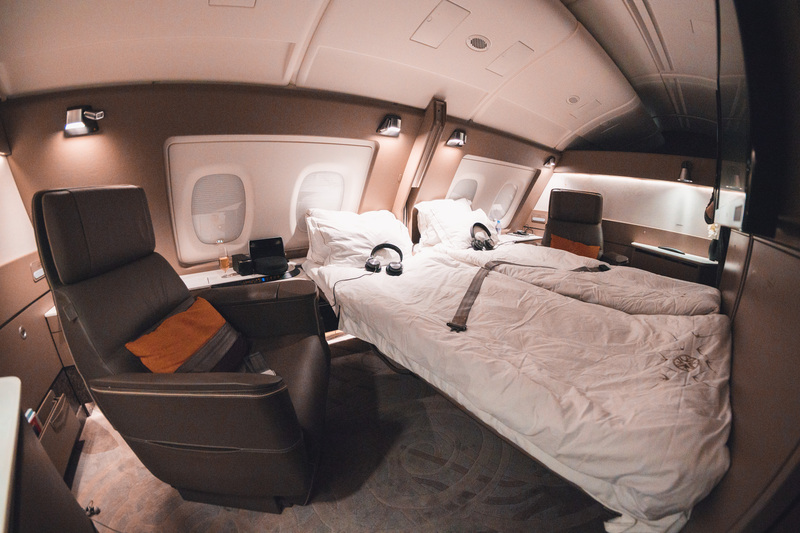 And while coming in to land in Singapore, the suite door slammed closed. 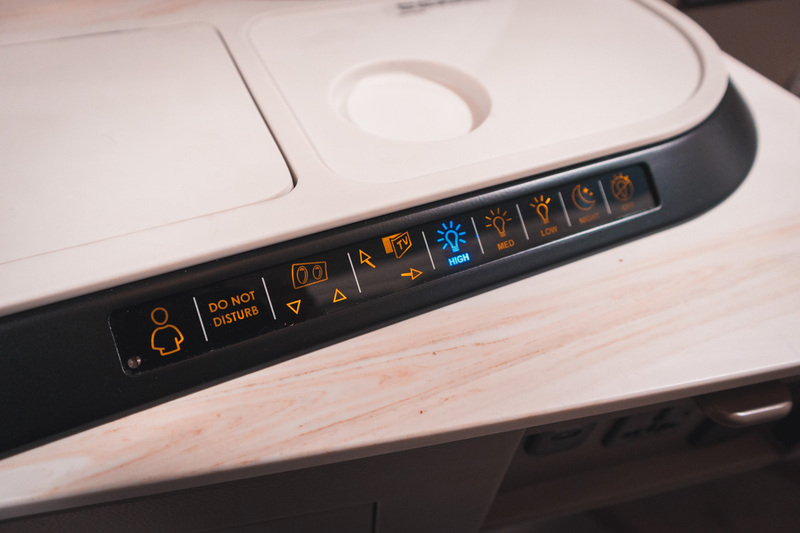 The motorized chair has 4 preset positions: take-off/landing, window facing, bed, and TV/meal service. If you recline your seat and extend the leg rest, it will retract if you rotate the chair in any direction. Strangely, in the “TV” position the chair isn’t positioned square to the TV, but is instead angled toward the suite door. 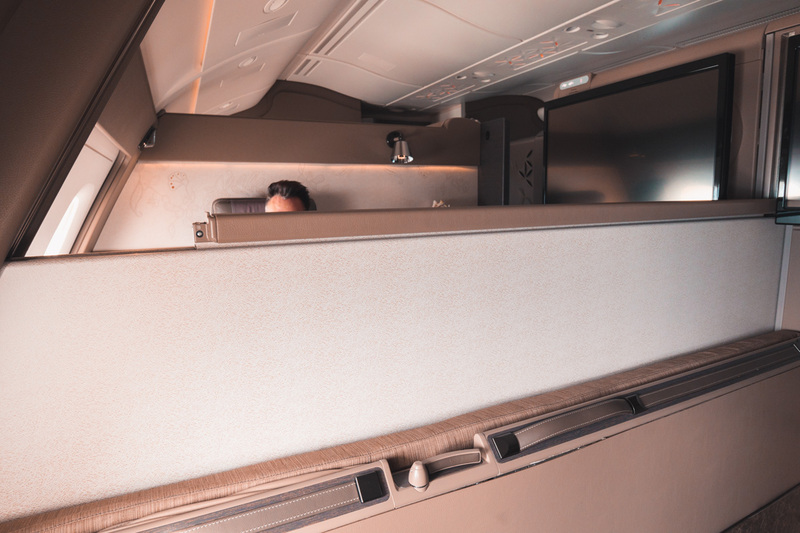 This creates an uncomfortable scenario of staring directly at your neighbor across the aisle when both suite doors are open — a scenario made even more uncomfortable when they’re in their PJs! 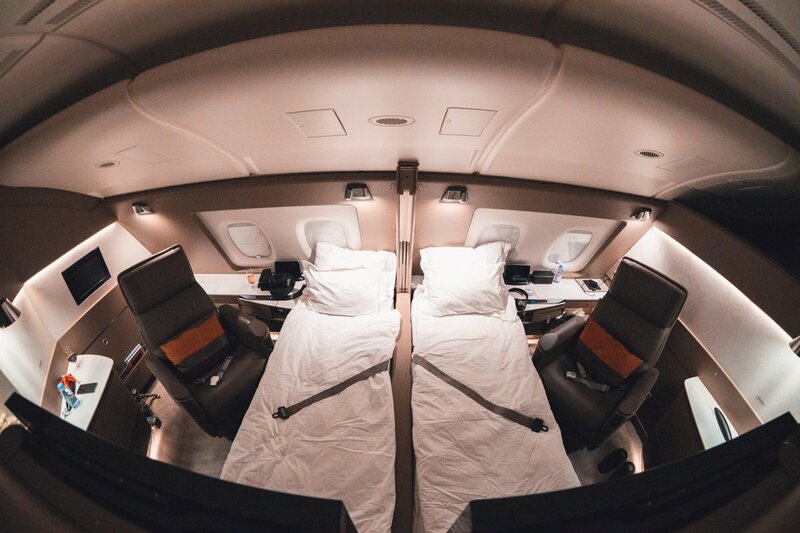 When you’d like to sleep, simply inform the crew and they’ll fold your bed down from the central wall that separates the suites. I found the bed, linen, and pillow very comfortable. Some may argue the bed is too firm, but I personally prefer a firmer mattress. I’m 5’10” and had plenty of room; if I stretched out my toes, I could touch the wall of the suite. There aren’t any individual air vents, and unfortunately the air conditioning felt like it was set to “furnace” during the sleep phase of the flight. Thankfully the privacy of the suite doors meant I could sleep in my underwear — that cabin temperature combined with the thick Lalique PJs made it otherwise impossible to get to sleep. 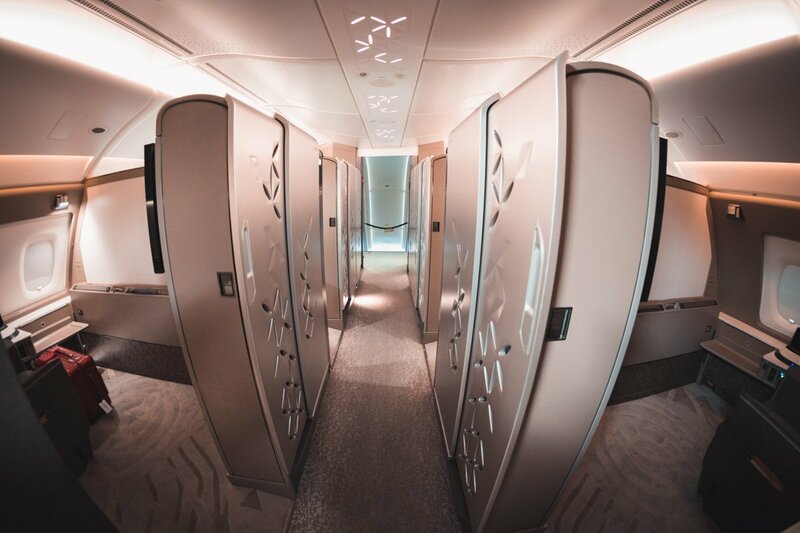 The first class cabin is configured in a 1-1 layout with 6 private suites separated by a central aisle — a layout first pioneered by Etihad Airways. 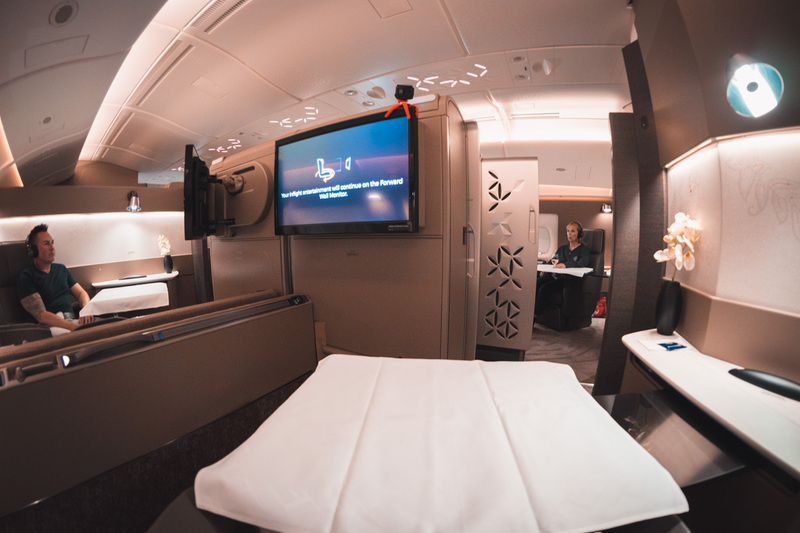 However, where Etihad has 9 Apartments and a 3-room Residence on the forward upper-deck, Singapore Airlines fits just 6 suites…so as you can imagine, the suites are huge. It also means every suite is a window seat. 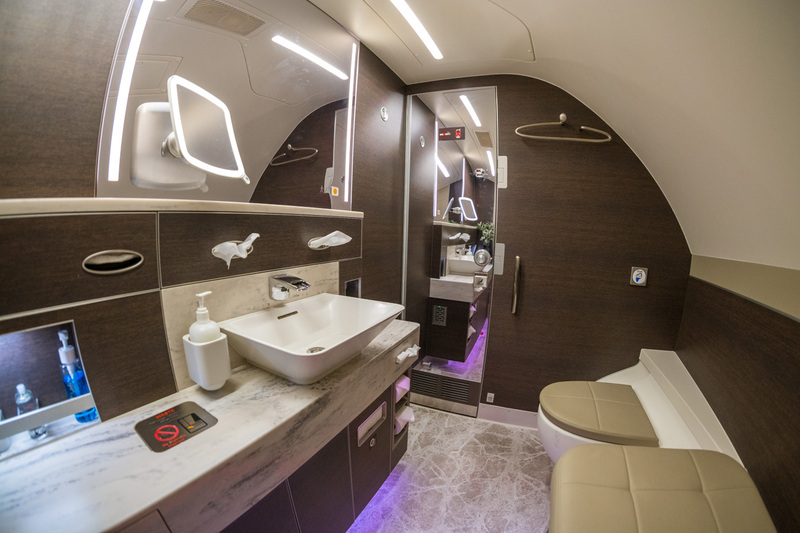 Two lavatories are located at the front of the aircraft. 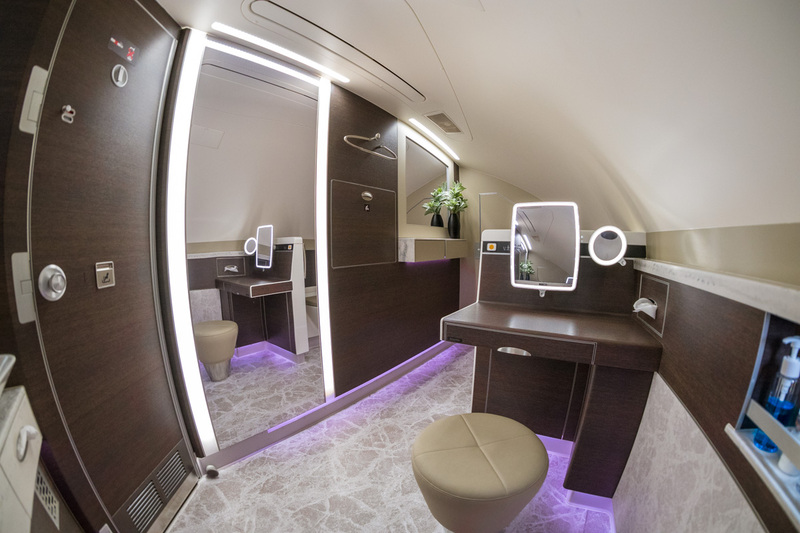 The larger one also has a stool and vanity mirror, but there is no shower like on Etihad and Emirates. A Lalique amenity kit is supplied, which includes a candle (complete with a warning not to light it on the plane! ), body lotion, lip balm, and soap. PJs, an eye mask, socks, and slippers are also provided. Before takeoff I was offered a choice of Dom Perignon 2009 or Krug 2004. Decisions, decisions! 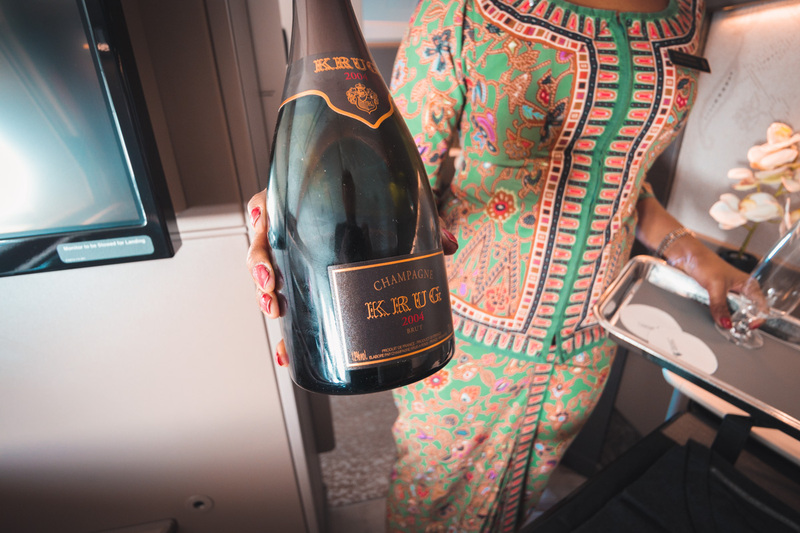 After takeoff, warm nuts and more Krug are served. 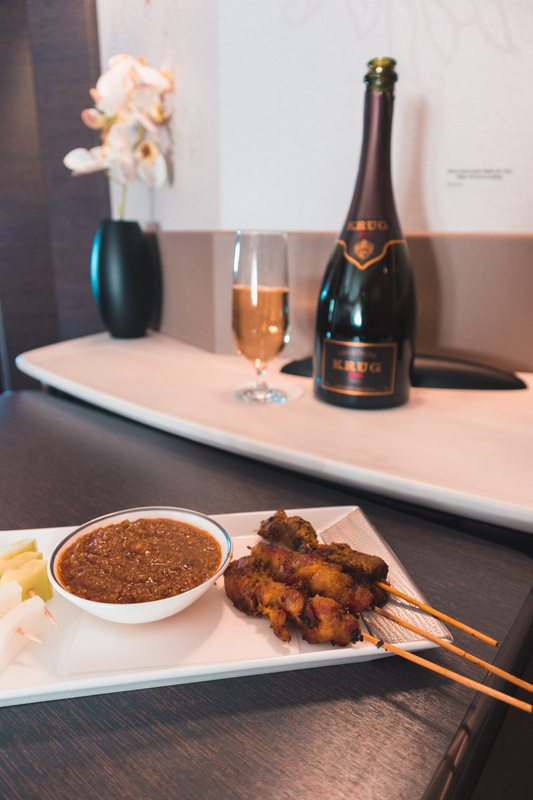 Half an hour after takeoff, Singapore Chicken and Beef Satay skewers are served with onion, cucumber, and spicy peanut sauce. And of course…more champagne. 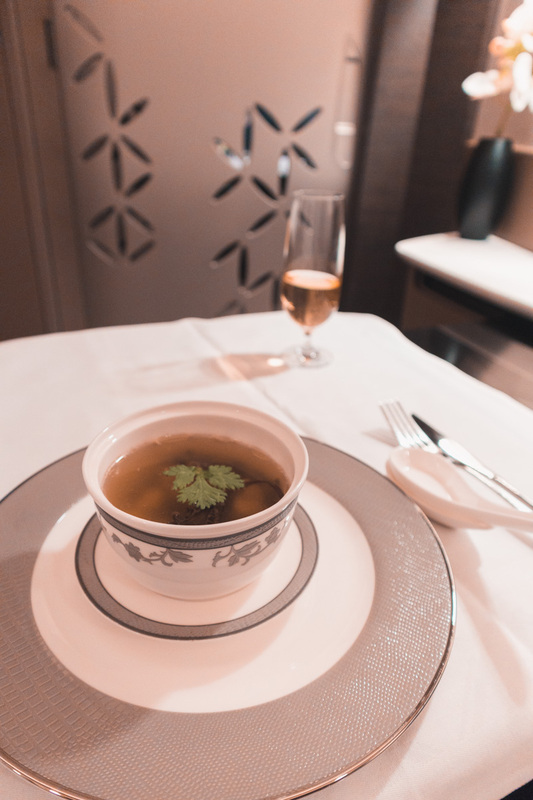 I followed this with chilled Malossol Caviar and more Krug, then an Oriental Clear Chicken Soup with Chinese morel mushroom and black fungus. The other alternative was Marinated Scampi with Radish and Saffron Yogurt with chickpeas, orange, and frisee; or Basmati Rice Cream Soup with prawn, rice crispy, and anchovy-pesto sauce. This salad included lamb lettuce, egg, and caramelized walnuts with a choice of honey-sherry vinaigrette or creamy French dressing. 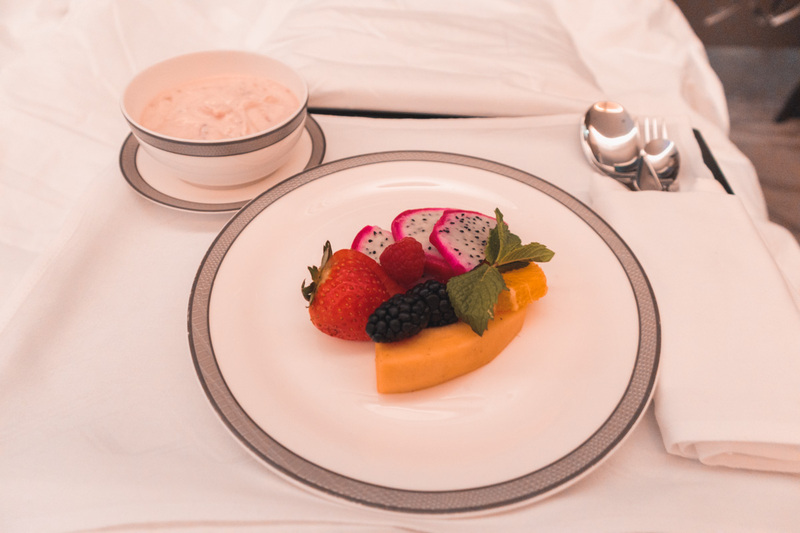 Singapore Airlines provides guests a preview of the menu online before you even step onboard. 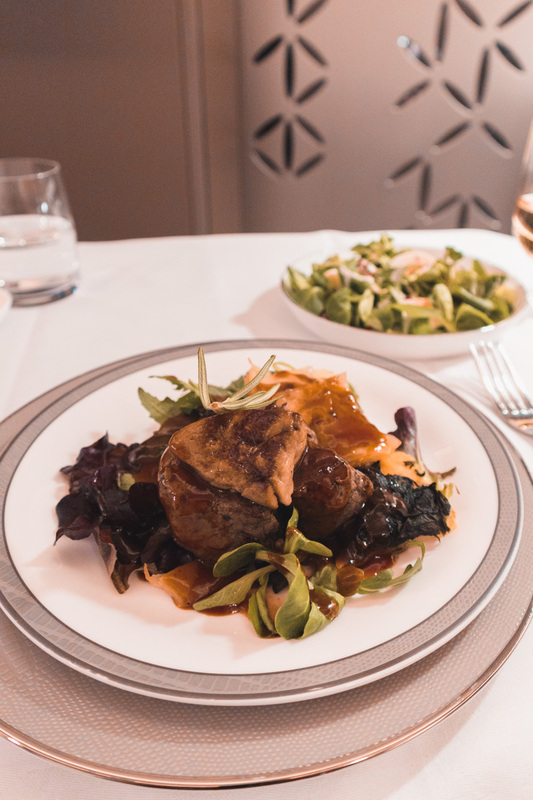 Perusing the menu for the flight, I decided against the limited “Book the Cook” options and instead ordered the Rossini Style Beef Fillet onboard, which came with seared foie gras, marsala wine sauce, anna potatoes, spinach, and mesclun salad. 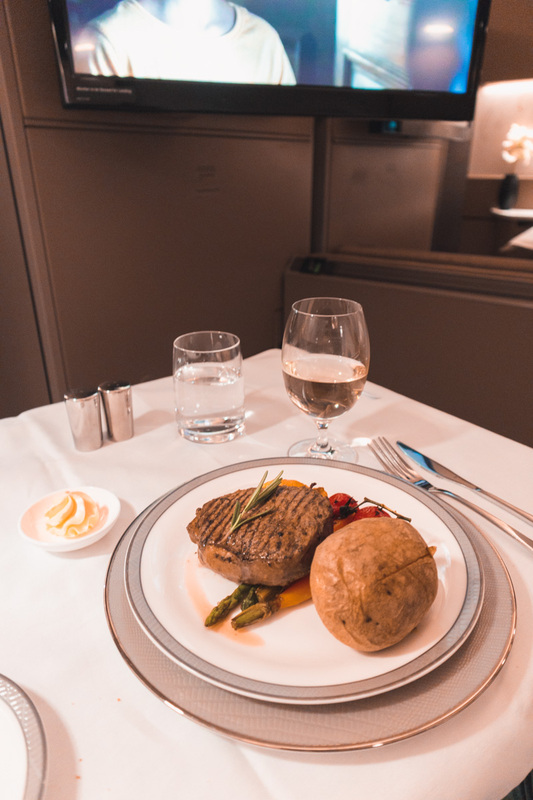 Hands-down, this was the best-cooked piece of beef I’ve ever had on an aircraft! The beef paired beautifully with the Château Cos d’Estournel Saint-Estèphe 2006 (USD $250 a bottle on the ground). 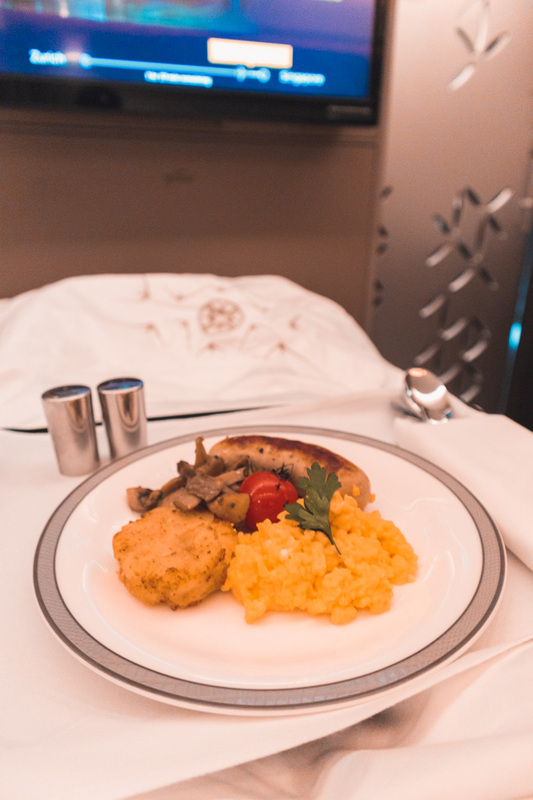 Lukas decided to Book the Cook and selected the beef fillet, also commenting that it was the best-cooked steak he has ever had on a plane. So kudos to Singapore Airlines catering in Zurich and to the crew for perfectly reheating! 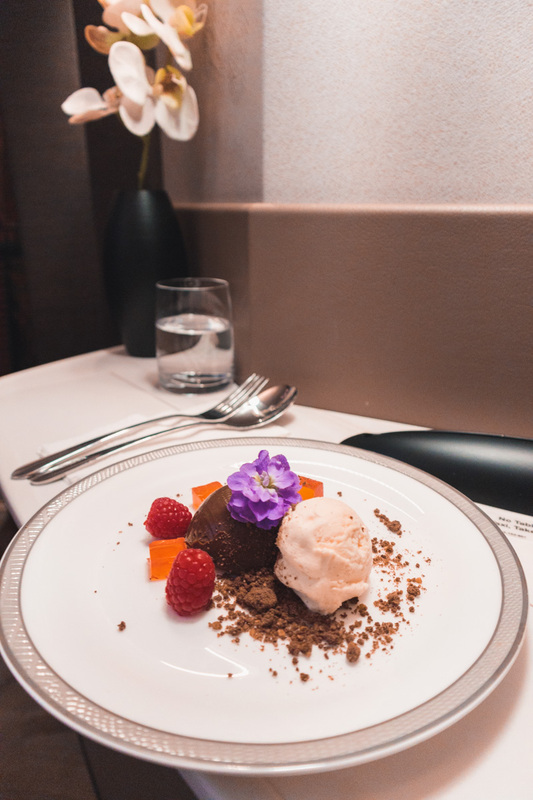 For dessert I opted for the Gianduja Chocolate Cream with sable crumbs and vanilla ice cream, fresh berries, and rose jelly — which not only looked amazing, but was delicious too. I had to pass on the cheese, fruit, and pralines…after everything I had already consumed, I was about to lapse into a food coma! Breakfast commenced 2 hours before arrival into Singapore. Fresh eggs prepared baked, scrambled, or boiled with vine-ripened tomato, mushrooms, and roesti potato. Choice of grilled bacon or veal sausage. I opted to have breakfast in bed, because why not!? So the crew brought it out on a tray for me. I also personally prefer to start with the hot option so requested scrambled eggs to come out first — otherwise they would have brought out the fruit to begin with. Overall, I was super impressed with all the meals — everything was cooked perfectly, including the beef (which can be hit-and-miss in the air). The eggs were still moist, and there was an extensive selection of options. You will not go hungry! 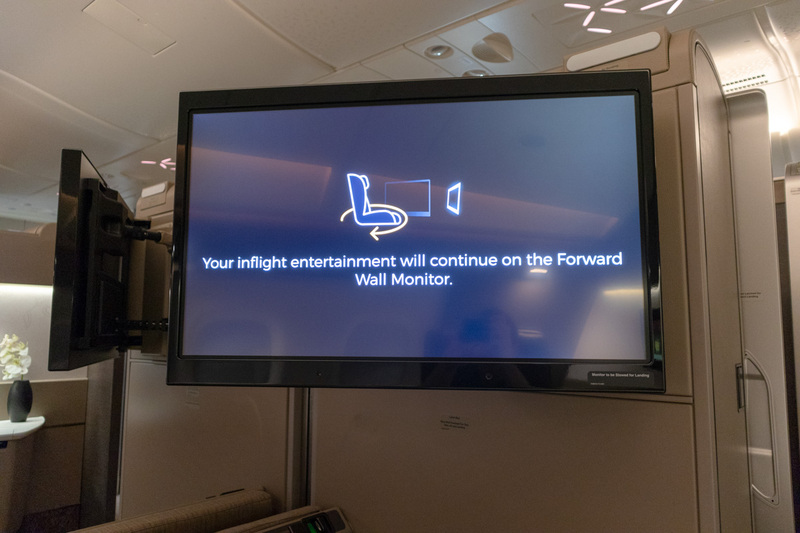 At the beginning of the flight, the crew introduced themselves, mentioned how excited they were to be working on the new A380, and said it was only their second flight on it (the first was just 2 days earlier inbound from Singapore). This was only noticeable during the meal service, when they continued to leave my suite door open and I reminded them to close it each time. I really didn’t want to watch the lady across from me feeding her face (and vice versa, I’m sure). …or rotated to face the bed. The entertainment system has a huge selection of new release and classic movies, TV shows, audiobooks, music, and podcasts. 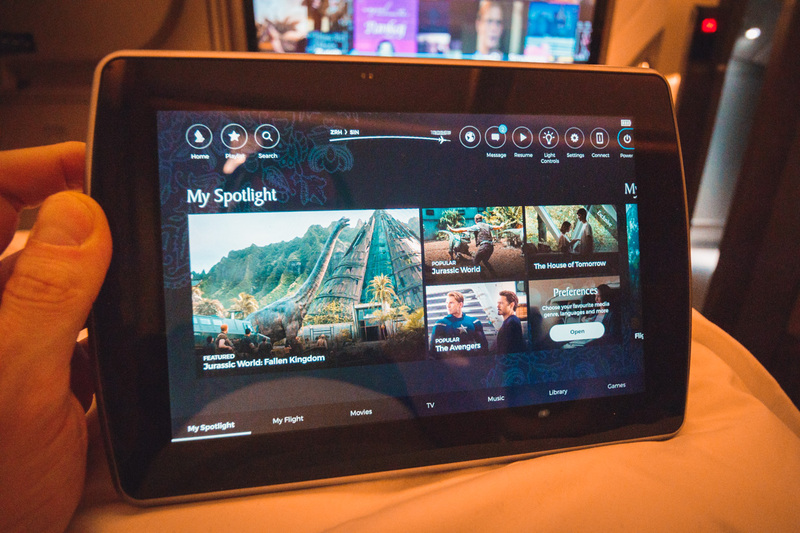 You can control the IFE using either the in-suite tablet or the latest Singapore Airlines smartphone app, which can be linked to your seat number. I had a few issues with the tablet releasing from the holder — after consulting the crew, I had to yank on it with a huge amount of force to get it to release. After that, I didn’t try to re-dock it until landing. I also had an issue with my IFE system; there must have been a bug with the seat position sensor. After takeoff I angled my seat ready for the meal service, but only the forward screen continued to play content. After adjusting the seat position for a few minutes and turning the screens on/off, I couldn’t fix it myself and called the crew. Within 2 minutes, I had 4 crew members in my suite trying to work out what was happening. After about 10 minutes and 2 system resets, they managed to get the larger screen working. However, the content was then locked on that screen — so before landing, the forward monitor didn’t work. 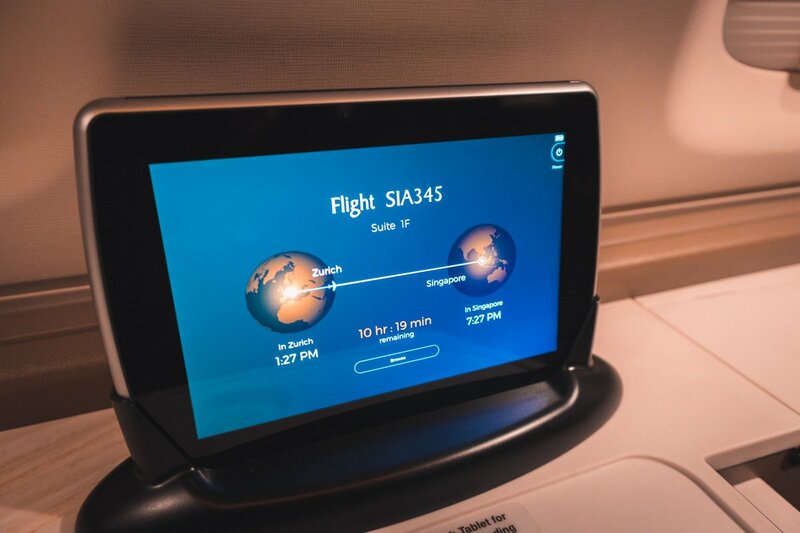 Singapore Airlines provides complimentary internet for first and business class passengers, but with only 100 MB for first and 50 MB for business class. Make sure you turn off all background data usage, or you’ll burn through your allowance in no time! They also charge by the hour and include data limits, the maximum being 3 hours or up to 150 MB for USD $12.99. The speed was good, clocking over 9 Mbps up and down. 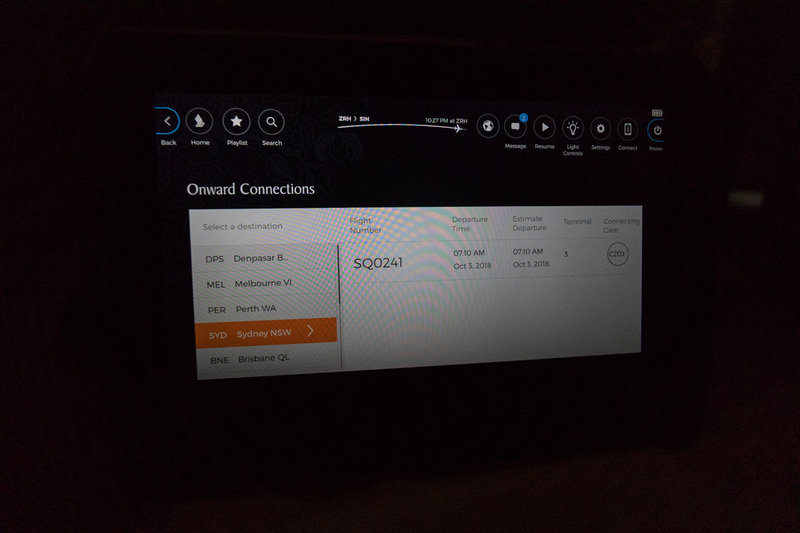 Shortly before arrival, connecting gate information is available to review on the tablet. Though it wasn’t 100% perfect, any oddities with the swivel chair direction can easily be solved if the crew remember to keep the suite doors closed. 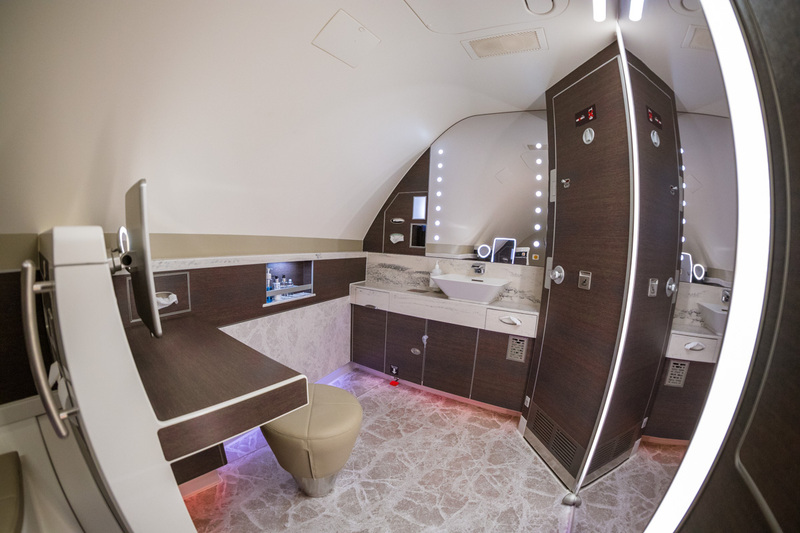 It was also concerning that there were quite a few technical bugs for such a new aircraft: IFE/seat position, USB sockets, suite wall divider flying open on takeoff, and suite door slamming shut on landing. I also think it’s a missed opportunity not installing a shower in the largest bathroom (instead of the vanity mirror and stool). 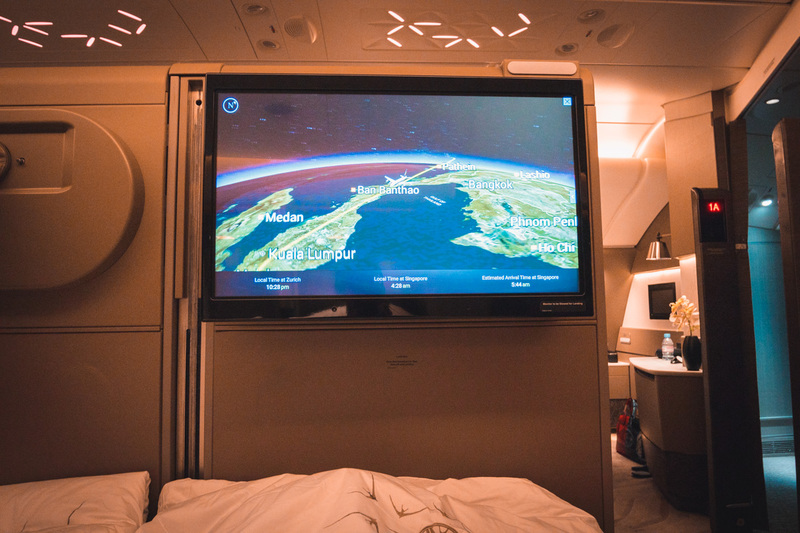 While I loved my first flight on this product in May, after only a 7-hour red-eye flight I was still on the fence as to whether I preferred it over the Etihad First Apartment. 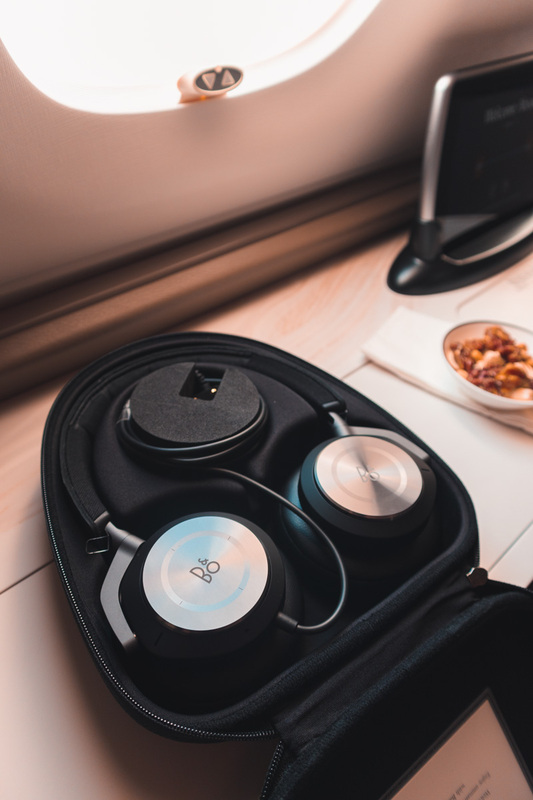 But after flying this with my partner and enjoying the full double-suite experience with its immense space over 12 hours, I realized this is my new favorite first class product. I continue to be amazed at the consistency of the Singapore Airlines crew, premium wine selection, and the quality/selection of the food. And to think we got all this for just $98 in taxes, when it was worth a face-melting $15,000 per person!! Greg got bitten by the travel bug at a young age while travelling with his Dad on business trips to Asia. He took over the family business in 2012 and uses it to maximise his loyalty points earning. His obsession with earning and burning loyalty rewards points allows him to travel over 100 days every year. 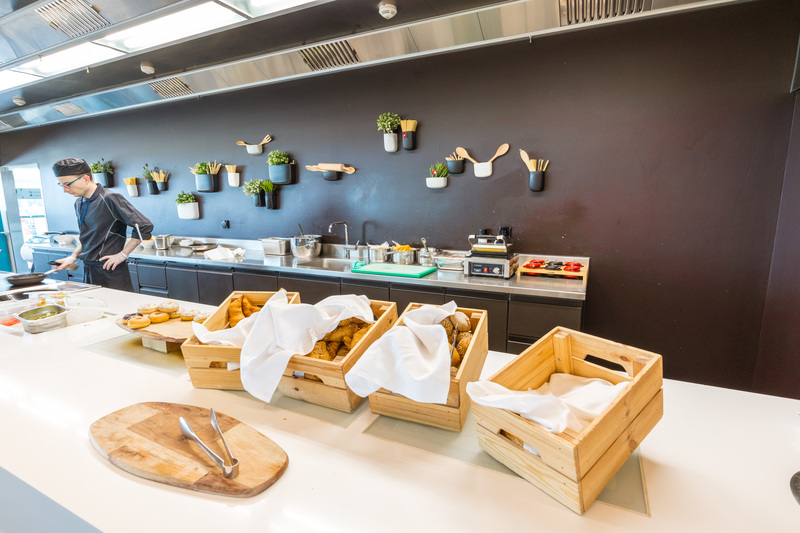 Thanks for the great review – did you try to eat with Lukas together, facing each other? Even with so much space, I would rather share the meal with my partner and not eat on the other side of the room. 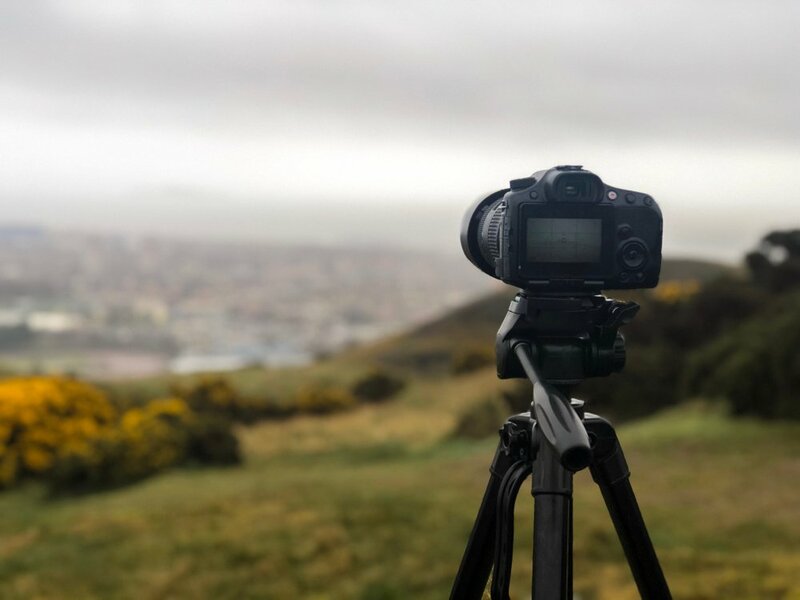 Thanks for reading and for the feedback! To be perfectly honest, when Lukas and I travel together we rarely sit together side-by-side as; 1) we both love a window seat and 2) we’re usually watching movies/working/reading so don’t have time to chat 3) it’s good to stretch the legs on a long flight so will stand up to chat to each other 4) if we’re going to be away with each other non-stop we really don’t really need to sit next to each other on a long haul flights also 🙂 So sitting on opposite sides of our Singapore Suites was actually eating closer together than on most flights so definitely wasn’t a problem 🙂 The crew can bring in an ottoman if you wanted to sit opposite each other however it doesn’t have a backrest so unsure how comfortable it would be. Thanks so much for sharing your experience. 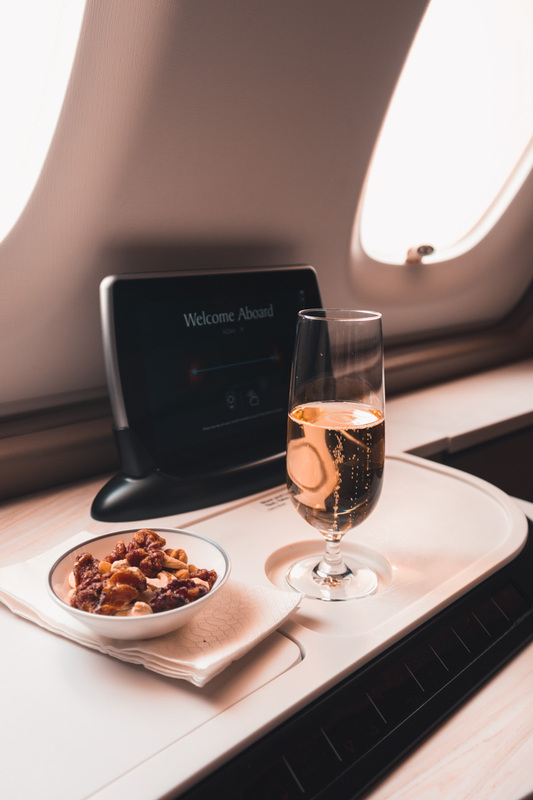 In order to book a confirmed ticket and also wait-list for first class suites, did you have to make sure you had 200K+ miles in your account (enough separately for each flight)? 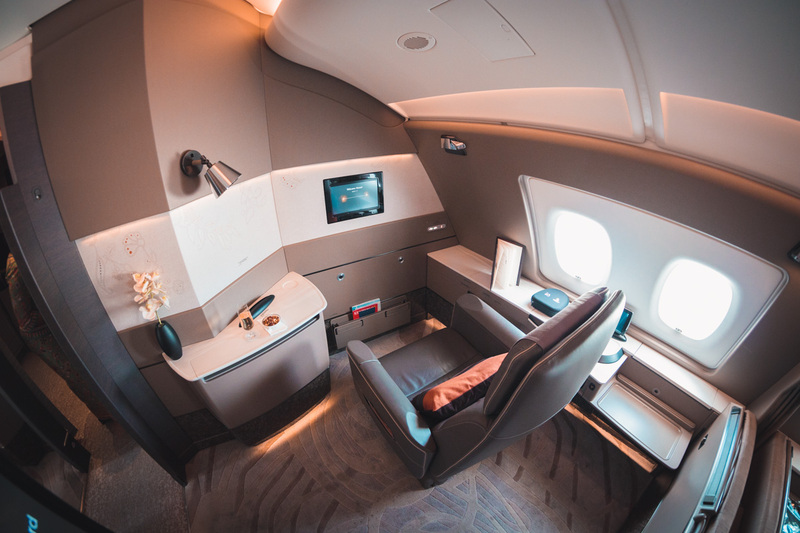 Or could you wait list for a first class suites flight after having used your miles to book the confirmed business seat? I’d imagine storing enough miles to reserve both flights in Singapore airlines is not ideal. Thank you for reading the review. Before you book the confirmed seat, waitlist for as many flights as you want whilst you have all the miles in your account. However, I’ve also had call center operators add waitlist options to already confirmed bookings without the extra miles in the account (as they obviously know you will cancel one to take the waitlist). 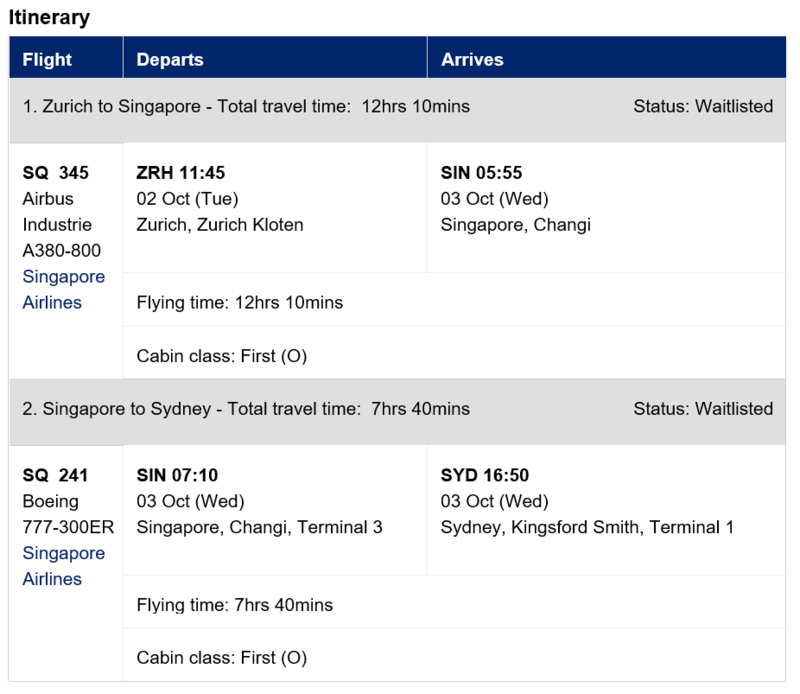 For the outbound flight out of Sydney, we had a three night stopover confirmed in Singapore and I had the SQ team add in a waitlist for a flight departing Sydney a day later than booked. This waitlist cleared a week before departure however we had already decided we wanted the three nights in Singapore. Thank you. I really enjoyed your review. 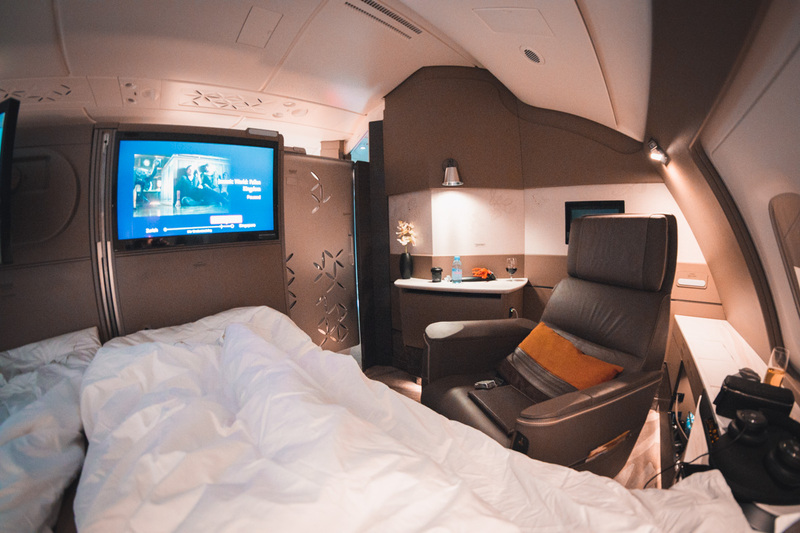 We have booked SQ suites from Paris to Sydney later this year. Only one sector will be on the new style suites, the other three in the older style. I’m sure the older style are also going to be a fantastic experience. I’m even more excited about our trip now I’ve read your review so thanks again. If any of your readers are interested, the fares out of Paris almost always seem to be much cheaper (ours were half) than London. It’s worth checking. Thanks so much for the kind words David — we’re glad you enjoyed the review! It sounds like you have quite the trip coming up… the new suites are stellar but even the old suites are fantastic! Have you checked out our reviews of the old suites yet? 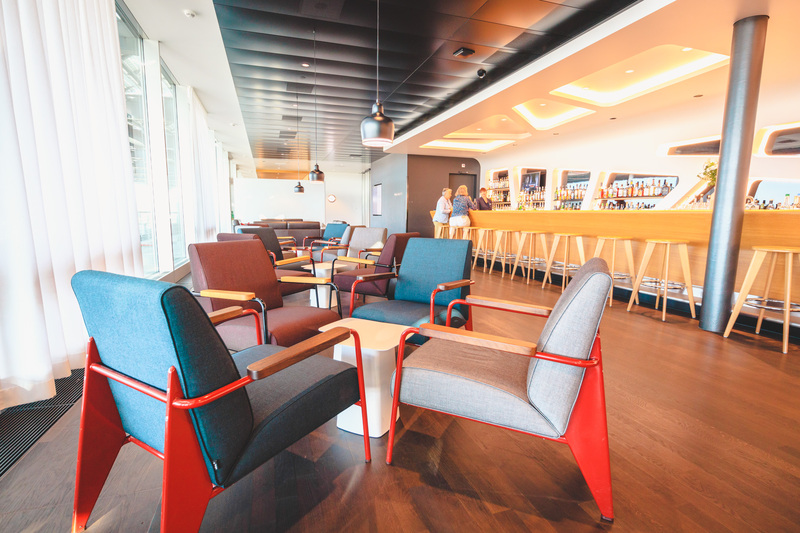 We love reading reviews & scouring photos before we take a flight too. Just seems to up the excitement! Hope you have a blast and if you have the time, check back in and let us know how you enjoyed your experience!